Tangerine Quartz Double Terminated Points (Brazil) - We have been informed that all Tangerine Quartz comes from the Santinho mine in Minas Gerais, Brazil. These Tangerine Quartz Points have a natural orange color and a sweet vibration. They have great formations, however many of the points do have some nicks and scratches on them. The orange color on these Natural Tangerine Quartz Points from Brazil comes from the presence of Hematite and water in the cavity where they grew. Slowly, over time, the water combined with Hematite to create rust that permanently bonded to the surface of the crystals. 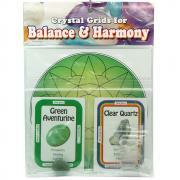 The combination creates a wonderfully unique natural quartz crystal. Some of these double-terminated points may also be "Self Healed". A Self-Healed Termination occurs when a crystal point breaks off of its original cluster or matrix, but then later "heals" itself when the natural conditions are again present to support additional crystal growth. When this happens, a new crystal structure grows over the place where the point was broken and therefore the crystal is able to "self-heal" the old wound on the crystal point. The "healed" areas on the crystal point have many little "mini-terminations" and if you look closely at this area under the light, you can see that there are natural facets that have formed over the old break and that the crystal is no longer "broken" but it has been able to heal itself. Self-Healed crystals will assist with healing yourself on a physical, mental, emotional or spiritual level. Those recovering from a trauma or upsetting emotional issues will especially find comfort from the healing support that is available from these self-healed tangerine quartz points. Self-Healed crystals are also good for working to overcome addictions. Self-Healed crystals are quite rare and we were delighted to find enough of these self-healed crystal points in a batch of tangerine points to put up this unique item. Metaphysically, these Tangerine Quartz Points exhibit an energy that creates an understanding of the events that effect us in our lives. Tangerine Quartz supports balance in the Sacral Chakra and helps to "Put the Past in the Past". 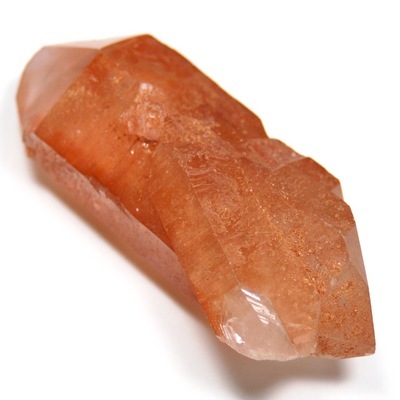 Tangerine Quartz is useful for calming after a physical or energetic trauma. Tangerine Quartz can help one to heal from a psychic attack, and fosters a sense of compassion towards an "attacker" by allowing an understanding of the motives of the "attacker," rather than assigning blame. Carrying Tangerine Quartz can help you get past the apparent "chaos" of the world, allowing you to recognize instead the underlying order inherent in the universe. This in turn, can raise your vibration to a more positive one, and make your interactions with others more enjoyable and productive. You can also use these sweet Tangerine Quartz Points to help you put the Law of Attraction into practice, with the knowledge that universal order can sometimes take longer than we expect to make itself known.